After twiddling with my audio interface for far too long tonight, I am resigned that the audio gods just don’t want me to record tonight. So instead, lets see some Free Comic Book Day pictures. You know you want to. First, I arrived early to set up the table. These are the nice folks waiting at the gate for me to open. No, they aren’t zombies. Why would you even think that? After I opened the gate, fun was had by all. I had 150 foam wolverine claws that I gave away in the first 30 mins or so, and we had a steady stream of folks for most of the day. Then at 3pm, the 501st arrived, and with them came Batgirl, lady Robin and Gambit. Here’s me and my crew with our honored guests. And then I put them to work for a little bit. 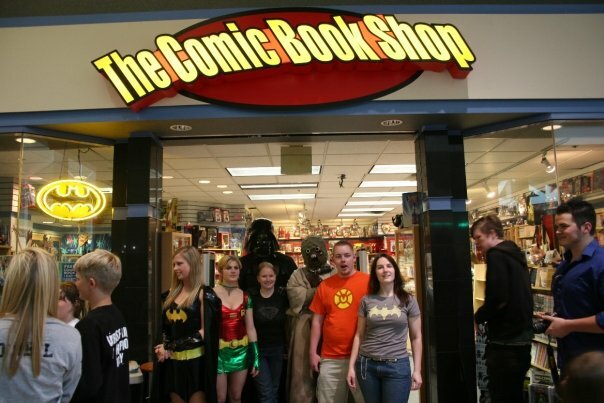 Thanks again to all involved for making this years FCBD so much fun. Ok, I think I have had time to process the Wolverine movie. I think that over all it was not that bad. In fact, some of it was pretty good, in a “let the movies be their own thing” kind of way. I liked Lumberjack Wolverine and his relationship with Kayla Silverfox. I really liked the X-Team stuff with Wade and Fred and Wraith. Then they went and messed with Deadpool. I felt like an angry 13 year old kid during much of the final act as my current favorite character was turned into sort of an ugly joke. So tonight I want to talk about the awesome Deadpool that I love so much. If you are new to the character, I think you should begin with Cable and Deadpool. By the time this series began, Wade had settled into his role as The Merc With The Mouth, and all of his special peculiarities were comfortable and worn in. His 4th wall breaking, his love of Bea Arthur, his habit of talking to himself via his monologue boxes. This was a series I binged on. I think I read all 7 books (before Deadpool Vs the Marvel Universe was out) in 2 days. 100% total awesome. I am currently reading the Deadpool Classics books, and I am halfway through book 2. It’s a lot of fun, especially the stuff I am reading now, but I’m glad that the Deadpool Classics Vol 01 was not the first thing I picked up. It took a while for him to develop his patter and his quirks. Even his speech bubbles start out with red outlines, instead of the yellow fill that I have come to be comfortable with. Like many things, Deadpool improved with age and experience. I still need to read that new Deadpool Secret Invasion hard cover, but whenever I have time to read, it’s sold out. I have a couple on order though, so maybe next week. Man, I’m out of practice with these things. I better call it a night. We’ll talk again this weekend.